Strontium MOT (blue fuzzy cloud) seen through vacuum window in Campbell laboratory. The 2013 Presidential Early Career Awards for Scientists and Engineers were announced on Monday, December 23rd. JQI Fellow and NIST scientist Gretchen Campbell was among the honorees. 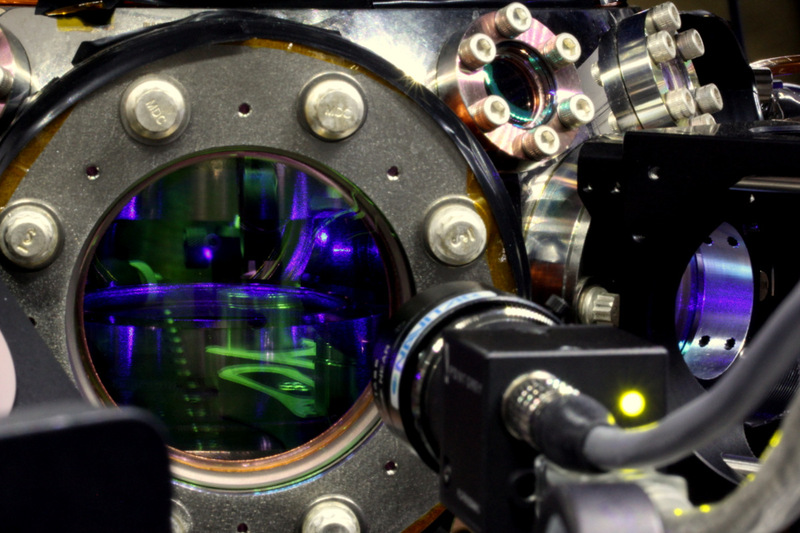 Campbell currently runs two experiments on ultracold atoms. One currently focuses on using a toroidal shaped Bose-Einstein condensate to build atomic analogs to electron-based superconducting circuits--so-called atomtronics. Her other experiment, currently in the building phase, will use strontium atoms to perform quantum simulations. Campbell received a Ph.D from MIT in 2006, where she worked with Wolfgang Ketterle and Dave Pritchard. There, she used Rb BECs in optical lattices to study atom interferometry, nonlinear atom optics and the superfluid – Mott insulator phase transition. These experiments included the first direct observation of the atomic recoil momentum in dispersive media. More recently, she worked as a postdoctoral researcher with Jun Ye on precision measurements and frequency metrology with an 87Sr optical lattice clock. The JQI also congratulates UMD Alumna Ana Maria Rey, also a NIST employee, on being awarded a 2013 PECASE.